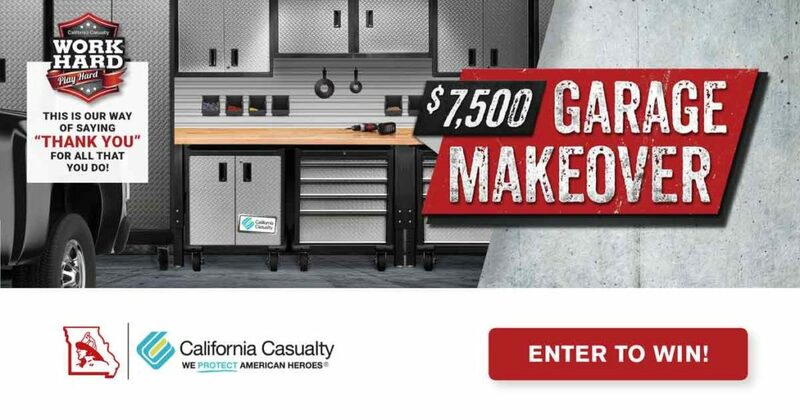 2019 Work Hard/Play Hard – Win a Garage Makeover from California Casualty | F.F.A.M. California Casualty, Firefighters Association of Missouri endorsed program for auto & home insurance, wants to thank you with a new Work Hard/Play Hard Sweepstakes. One lucky firefighter, EMT or law enforcement officer will receive a $7,500 Garage Makeover. FFAM members can enter at www.PoliceFireGiveaway.com. The winner of the newest Work Hard/Play Hard Sweepstakes from California Casualty will be handed a $7,500 check to create the garage of their dreams. Imagine the possibilities: new cabinets, custom tool storage, shiny new flooring or even a beverage and snack area to go with a big screen TV. Whether it’s a gym, workshop, or refuge from the stresses of the day, California Casualty will help create the ultimate garage. It’s our thanks for the hard work first responders do, often putting their lives in danger, to keep our communities safer. The Work Hard/Play Hard “$7,500 Garage Makeover” drawing is open to all FFAM members; entries are being taken now through October 31, 2019, at www.PoliceFireGiveaway.com. The winner will be announced in November. FFAM members can learn more about California Casualty and how it appreciates all you do athttps://mycalcas.com.